Signed by the Blue Jays in 1979, Tony Fernandez played 12 memorable seasons in Toronto, winning the hearts of fans with his patented submarine-style throws, unparalleled range and clutch hitting. The popular Dominican shortstop suited up for 15 games with the Jays in 1983, before being named the club’s top rookie in 1984. In his first year as an everyday shortstop, Fernandez hit .289 to help propel the Jays to their first American League East title. Over the next five seasons, Fernandez established himself as one of baseball’s best all-around shortstops, leading the Jays in batting average twice (1986, 1987), hits three times (1986, 1988, 1990) and triples four times (1986, 1987, 1989, 1990). He was also a three-time all-star and four-time Gold Glove winner during that stretch. After two seasons in the National League with the Padres and Mets, Fernandez was dealt back to the Jays in June 1993. He would proceed to hit .306 in 94 games and play an integral role on the World Series-winning squad. In the six-game Fall Classic that year, Fernandez hit .333 and drove in a series-best nine runs. Following one-year stints with the Reds, Yankees and Indians, Fernandez returned to Toronto to hit .321 and drive in 72 runs in 1998. 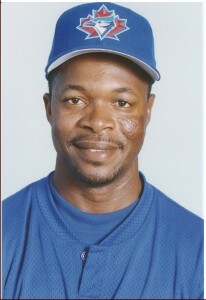 He followed that up with a .328 batting average in 1999, the fifth best single-season average in Jays history. In his final tenure in Toronto in 2001, Fernandez set a club record with 16 pinch hits. The Blue Jays legend retired as the club’s all-time leader in hits (1,583), games played (1,450) and triples (72), and ranks third in batting average (.297). For his efforts, his name was added to the Blue Jays Level of Excellence in 2001.